Jan. 11, 2018 at 9 p.m. to Jan. 12, 2018 at 4:30 a.m.
Greetings massive!! 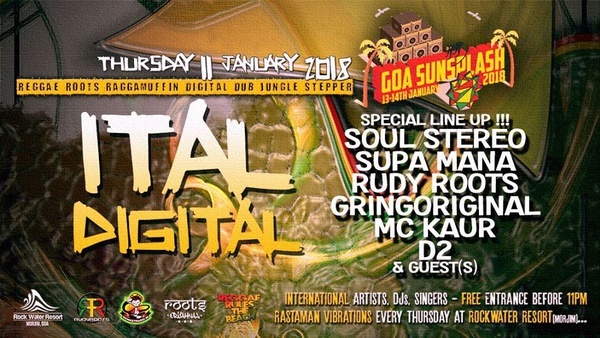 As an official Goa Sunsplash pre party, we've got a sick line up for next Thursday, 11th January 2018!!! We got number Ones artists to mash up Rock Water Resort, at Ital Digital !! >>>>> Coming straight from France, we got the Big Bout Yah, the man called Fatta from Soul Stereo, ready to set the place on a huge fire!! >>> We got the Irie Supa Mana, here to make you jump and make your legs skank as much as you can! >>> We got MC Kaur ready to show you her versatility through all genre from reggae to hip hop, full of fresh lyrics! >>> We got Rudy Roots ft Gringoriginal, here to give you usual bun fire vibes, from the accurate Rudy's set, through the killing vocalist and MCing of Gringo!!! And for the warm up, we got the great D2, outta Mumbai, to start the dance!!! Make sure, you'll be there!! !